Kacico Dance, Kansas City Contemporary Dance, is a not for profit professional modern dance company of the highest quality in Kansas City. Kacico presents public concerts and programs locally and regionally in a variety of presentational forms for audience enjoyment, enrichment, and cultural education. Its mission includes creating and performing excellence in contemporary dance and raising the level of contemporary dance in Kansas City and the mid-west region to national levels and national notice. Founded by Michelle Diane Brown, Kacico Dance grew under her artistic and executive direction for five seasons. As Artistic Director, Ms. Brown created and presented choreography that expressed a strong, fluid, exquisite physicality and a compositional cleverness. A review by Lisa Sagolla in the Kansas City Star (1/20/07) reads, "With her tickling trio, Moving Into Stillness , like an actor directed to play 'boredom,' Michelle Diane Brown charged herself with a difficult task: to make a dance about stillness. But she succeeds admirably, finding vitality and visual interest within the making of the static body configurations." The artistic direction of the company is under 3 veteran dancers: Allison McKinzie, Holly Harmison, and Maggie Osgood Nicholls. These three artists are dedicated to preserving and developing the artistic excellence of the company. 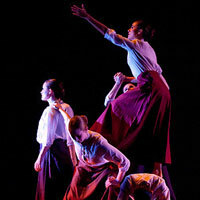 Highlighting original work from other artists is a mainstay for Kacico Dance. Recent collaborators include choreographer Julie Rothschild (Boulder, CO), Kansas City musicians Dave Patmore, Mack Tilton, Karim Memi, Erik Karlsson, Rick Malsick, and Laura Lisbeth, and the KC Chamber Orchestra.